From blow-dry bars to makeup-only Blushington, Angelenos have wholeheartedly embraced the one-service beauty salon trend. But, if these blowdryer- and mascara-wielding stylists are simply not enough to achieve that look you're coveting, behold the brand-new spot Just Extensions. 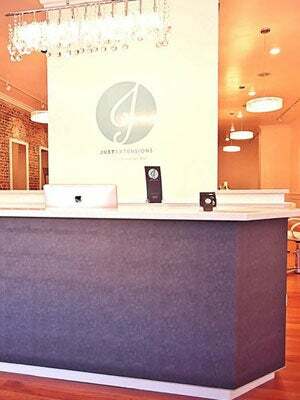 The name says it all: Just Extensions offers hair-lengthening services for women who are fed up with too-high prices and overly time-consuming applications. Expect to shell out between $100 and $300 for the treatments, which include micro-links, braided sew-ins, beaded one-step wefts, and clip-ins. We have to say this sounds like a brilliant idea, because for every gorg cropped cut out there, there are 10 Hollywood beauties with long, luscious hair sparking envy across the globe. Now the rest of us can get our hands on that length and volume we weren't blessed with! Where: Just Extensions, 358 South La Brea Avenue (near West 4th Street); 323-413-2434.